Kite House offers 4 unique bedrooms with ensuite bathrooms accommodating up to 8 adults, plus 2 teens. The villa offers truly special views from the bedrooms. 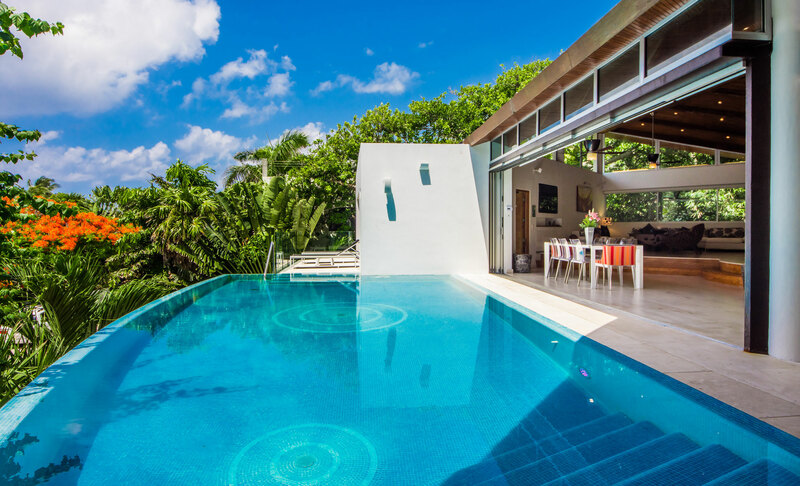 The master suite opens up onto the pool deck where you can get a glimpse of the Caribbean Sea. The second bedroom, also known as the Mayan bedroom, boasts unique views of the ancient Mayan Ruins! The third bedroom is considered to be the jungle bedroom as your terrace opens up to lush tropical gardens and jungle, and hence captures that feeling of privacy and seclusion, yet just minutes away from bustling Playa del Carmen! The fourth bedroom is considered to be a loft with its pull-out king-size bed, and the upper mezzanine also has room to host another 2 guests with a second king-size bed. Recently built in 2011, Kite House defines the concept of state of the art technology with its filtered circulating air system, automated blackout curtains, armored and sound proof glass doors and windows. The infinity pool uses no chemicals, and has a “swim against the current” system using a 5.5-horsepower motor for those guests who wish to keep in top shape while on holiday. The large Jacuzzi in the pool area can fit up to 9 people. Guests can quickly get a sense of seclusion with the villa’s abundant garden and jungle surroundings, but simultaneously can enjoy the villa’s convenient location near the heart of the action. Kite House is located just 2-3 minutes’ walk from the exquisite, quiet white sandy beach and just 20 minutes walking distance from Playa’s famous promenade, 5th Avenue, where you will find an abundance of trendy shops, authentic international cuisine, Italian cafes, lounges, disco clubs, beach clubs. While Kite House is most definitely pleasing to the eye and senses with its modern technology and simple beauty, the villa prides itself on its guest services. The villa defines exclusivity through its staff dedicated to exceeding guest expectations. Kite House includes a full-time cook, personal concierge, daily maid service and complimentary round trip airport transfer. Christmas & NYE: Saturday to Saturday bookings only. Christmas can be booked for 7 nights and only in this case, if Xmas week is confirmed for one week, then New Year’s week can be booked for 7 nights.